Baking soda and water is often mixed into a paste to help ease the itching and discomfort associated with a minor skin rash. Do not make any special pastes or creams without physician approval for your diagnosed condition. Sometimes putting cream, paste or lotion on certain rashes may make matters worse. Do not apply baking soda and water to any rash without first talking to your doctor. Baking soda and water is mixed into a paste, which is used to treat certain types of rashes such as swimmer's itch and contact dermatitis. Swimmer's itch describes an infestation of the skin with certain parasites that come from mammals and birds. Snails release immature larval forms of parasitic flatworms into salt and fresh water, such as lagoons, lakes and ponds. Swimmer's itch develops on the exposed areas of your body that came into contact with the larval forms when they infect the skin rather than its usual host, which is typically a duck or other similar animals. Contact dermatitis describes itchy, red skin that is caused by touching an irritant. It may develop as an allergic reaction. Contact dermatitis can form because of bathing with a soap or wearing a perfume that you're allergic to . Symptoms of either type of rash that can be treated with baking soda paste are similar to that of any rash. You can experience patches of skin that are inflamed and irritated. Red bumps are typically visible; the bumps may resemble inflamed acne whiteheads or appear as hives. Your skin may swell and you will be tempted to scratch at the rash as it's very itchy. You may see oozing of pus that can be clear or yellow in appearance. Keep the affected area clean and dry. 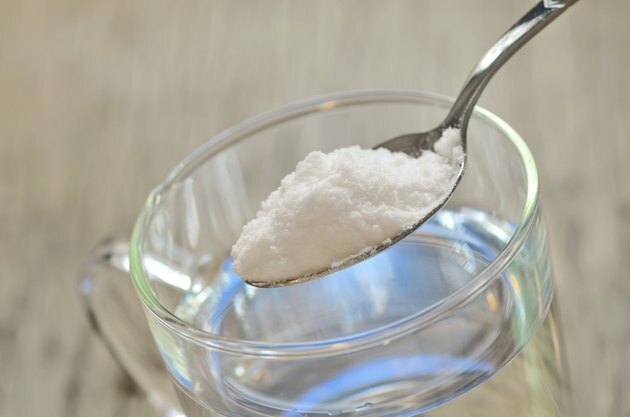 If your doctor has granted permission, you can mix baking soda and water until it becomes a paste and apply it to the itchy areas of the rash. Your physician may also recommend using colloidal oatmeal powder or cornstarch with water to ease the itching and discomfort associated with your rash. You can also apply a cool washcloth to the affected area to relieve any stinging or burning sensation that you may have; do not use hot water as it may irritate your rash even further. Avoid coming into contact with the irritant that caused the rash, if you know what the suspected irritant is. If you are suffering from contact dermatitis, eliminate suspected irritants. Ask yourself if you've bathed with a new soap, if you've used a detergent on your laundry or have put on a new or different lotion or perfume. Sometimes contact dermatitis can be caused by a chemical, such as a household cleaner or an industrial chemical. If you come into contact with something that begins to immediately irritate your skin, flush the affected area with lots of water to wash away the irritant and remove it from your skin.